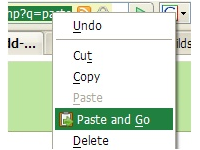 Just released Firefox’s Extension Paste and Go version 3. Actually I didn’t make it from the scratch, I just update it to make it work with Mozilla Firefox 3.x.x and it’s working fine (this release will work on Firefox 1.5 to 3.x.x). Here I’ll try to show you how the extension will ease the use of Mozilla Firefox. Hope this will be useful for you and you will enjoy the extension. If you encounter any problem, please leave a message. Update, 16 September 2009: Released 1.0.4 with Simplified Chinese translation. opera has this option from before! can you tell me how to change the language of the Paste and go from context menu? Thanks omi vai. I am using it in Flock2(mozila3 based social browser) and working fine. Thanks for this nice plugin. The search engine roll feature doesn’t seem to be working. Or am I doing something wrong? Thank you *SO MUCH* for updating this extension! I’ve been waiting forever, since I take it for granted in Opera, so I missed it in Firefox. Great work! Thanks . trying this .